Milan fashion week for a blogger means attending to fashion shows, presentations, parties, exhibitions, but also conferences or meetings with the protagonists of this world. Thanks to the last Vogue Experience held in conjunction with the Milan fashion week in September, finally I had the opportunity to meet the designer duo Aquilano.Rimondi. Their career as a designer duo began in 1998, when they work as fashion consultants for Max Mara; then in 2004 they gave life to the 6267 fashion project, which won the competition WhoIsOnNext ? 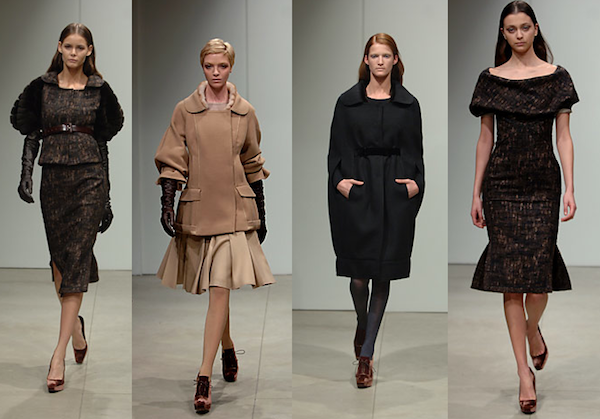 2005 allowing them to present the collection in Milan. Since then it has been a continuous succession of experiences that crowned them as the true protagonists of the international scene, and it is not a coincidence that Anna Wintour once commented: “the show of 6267 is the only reason for coming to Milan”. Soon their road to success becomes filled of many important goals: in 2006 they are appointed as creative directors of the knitwear brand Malo, bringing it to show in New York; in 2008, are appointed as creative directors of the late Gianfranco Ferré, and at the same time they founded their own Aquilano.Rimondi fashion brand, which conquered season by season the most cultured niche of fashion, thanks to a “balanced opulent” style, looking beyond the fleeting seasonal trends. Besides the ongoing fashion consultations and collaborations with the most important Italian brands, in 2011 they become the creative directors for the female line of Fay, and by this year even for the male one. At the Vogue Experience held in Palazzo Morando there was only Tommaso Aquilano, because Roberto Rimondi was busy with the models for the fashion show of the next day. During the meeting with the public have emerged very interesting reflections on the way they approach fashion and creativity in general. About the eternal dualism between art and fashion, as fashion designers they recognize a state of independence of fashion from the art: “Fashion is a job. 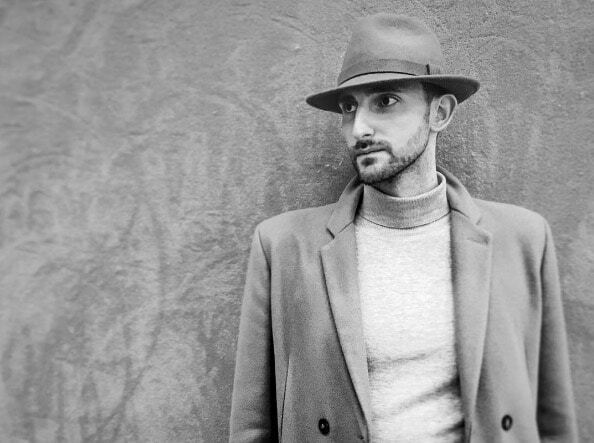 I work with art, but I’m not an artist, I am an hard worker” said Tommaso Aquilano. Art is “only” a source of inspiration for the duo, it is a means to get to the finished product. Art is the input that triggers the creative instinct, allowing them to mix the various disciplines in a crescendo of excesses, passing from a Velasquez’ brush stroke to Bernini’s sculptures, balancing all through a rational labor limae. “Roberto has a more rational approach, I am more instinctual. We have both our own visions and then we put them together, making even improbable mixes”. 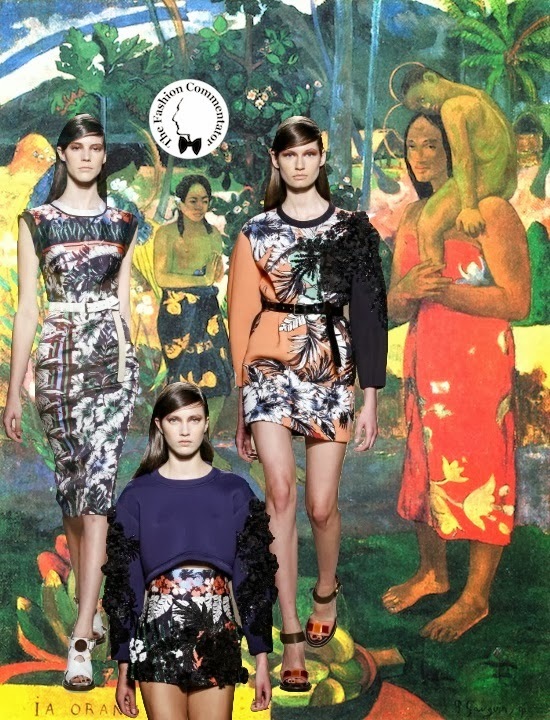 The latest spring summer 2014 collection which re-traces the exotic years of Paul Gauguin‘s life, is the most striking example of their stream of consciousness inspired by the art. 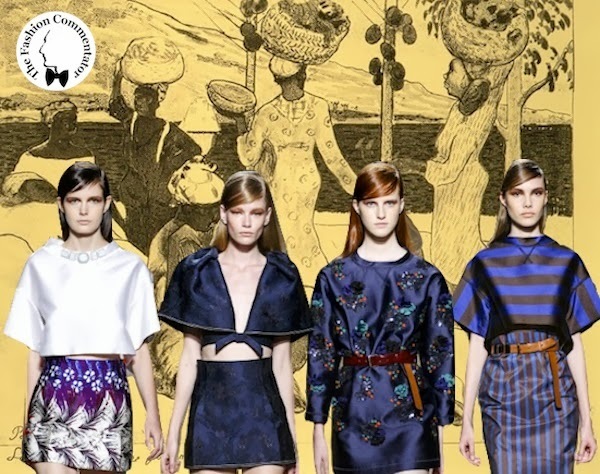 The printed fabrics declined on hoodies, mini dresses and princesse gowns, remind the sarongs and robes of Haitian women portrayed by the painter: stripes and floral contrasting patterns, shimmering shades, complementary colors and jais appliqué are the main themes of the collection, an opulently concept, applied on extraordinarily contemporary shapes. – and finally some reflections regarding the role of the creative director “The more interesting challenge for a fashion designer is risking everything with your own brand, but lately seems that becoming a creative director is the acme of the career for a fashion designer, maybe even neglecting your own brand. The creative direction for other brands is very nice, but from one day to another you can be thrown out and left without anything in your hand”. 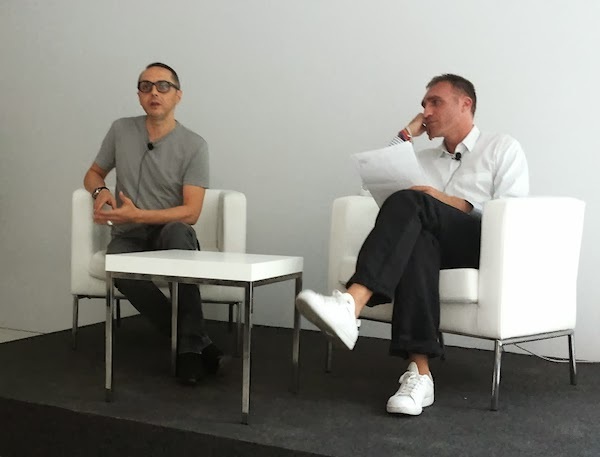 Talking about their experience as creative directors at Gianfranco Ferré, Tommaso said: “When you’re a creative director you can’t be yourself at 100% because you have to metabolize something that is not yours. At Gianfranco Ferré we had one of the best experiences we could live because we were confronting with a sacred monster of the Italian fashion. Thanks to Gianfranco Ferré archive we have known a long history starting from his minimalist period with straight jackets enhancing every type of silhouette, and in our first collection (spring summer 2009) we wanted to re-propose that minimalism even in the fashion show set by removing all the Art Nouveau decorations of the room where he used to parade. Nobody expected it, but everybody liked it”. The audience, made of young students, aspiring designers and aspiring fashion journalists, presses the designer with questions about the inspirations and the career, but they mainly ask for some suggestions for the new designers: “Our participation to Who Is On Next? has been the first real opportunity to make ourselves known by the international press and buyers. I suggest to the new designers to be “small” and seek their own identity, don’t even thinking to compare with top brands that have billionaires budget for their fashion shows. You need to be sincere in what you do. We are still building our identity, we are identified with a niche product mainly focused on textile and silhouettes research, but thanks to Fay (of which they are creative directors from 2011) we had the opportunity to get closer to ready-to-wear. The meeting ends with a question from the web audience who follows the live twitting by the Vogue Italia account: the passe-partout item for a woman in addition to the little black dress according to Aquilano.Rimondi. As much as frivolous was the question, I personally was amazed by the Tommaso Aquilano’s enthusiasm he replied. In his eyes you could see the creative instinct while he was imaging the outfit, describing it in detail and gesticulating with his hands in the air as if he was making the dress in front of the audience: “The little black dress is a wonderful item, but you risk to become a caricature. If you wear a velvet oversized sweatshirt with a mikado skirt and high heels shoes, the other women next to you wearing the lbd will disappear “. That single final creative moment gave concrete form to all the things Tommaso Aquilano said in the two and a half hours meeting. I will surely never forget it. Exhibition – The style of Valentina Cortese. Molto bella la cappetta dell’ultima collezione, in seta (6a foto dall’alto), un po’ meno entusiasmanti gli abiti più “didascalici”. Aspettavo con ansia questo post, ero curiossima di sapere come fossa andare questa Vogue Experience! Ho trovato molto interessanti le risposte date da Tommaso Aquilani, peccato che non ci fosse anche Roberto Rimondi! Trovo che l’arte sia una delle ispirazioni maggiori per quanto riguarda il mondo della moda, capita spesso che gli stilisti si ispirino ad essa! L’ultima risposta l’ho trovata molto interessante..il suo concetto di look passe-partout è molto innovativo ed interessante!! Un’esperienza superiore che esula dalla ressa compulsiva di moda (a volte solo apparente e raffazzonata) che mi piace! Sono molto d’accordo con la sua concezione di designer in quanto lavoratore e non artista. E’ una cosa che anche io come grafico rivendico sempre. Trovo che sia importante perchè l’arte ha quella importante capacità di interpretazione che ad un designer non può essere concessa: se un quadro per uno significa una cosa o un’altra non ha importanza, la chiave di lettura personale è propria dell’arte. Se un cappotto invece non sta bene perchè non rispetta le proporzioni lì c’è poco da interpretare: è un cappotto fatto male. Se un cappotto deve tenere caldo, se non riesce in questa cosa ha fallito. Che esperienza a dir poco fantastica! ” Nella nostra carriera forse abbiamo peccato di eccessiva ingenuità e fiducia, soprattutto in questo ambito “…Mi ritrovo in pieno! Voto 10 alle affermazioni di Aquilano, ultimamente amo le loro collezioni! Ale, post magnifico come sempre per contenuti e immagini. I tuoi collage sono meravigliosi. L’argomento poi per me è particolarmente interessante. Mi sarebbe piaciuto moltissimo partecipare a quest’incontro. Aquilano.Rimondi è un duo che mi piace tantissimo, forse mi faceva ancora più impazzire quando erano 6267, però sono bravissimi sempre. Molto interessante ad esempio l’ultima sfilata ispirata a Gauguin. Poi – come sai – mi entusiasmo sempre tanto per le collezioni che traggono ispirazione dall’arte. Riguardo alla conversazione, molto divertenti gli argomenti più leggeri e anche il parere finale sul capo passe-partout. Ma soprattutto mi ha colpito la frase sull’assenza di mecenatismo e sul do ut des; ahimè penso che sia proprio così in tutti i campi e da un bel pezzo. credo che il loro genio creativo sia uno dei migliori in circolazione in Italia! Anche io avrei voluto esserci, credo sia stata un’esperienza davvero formativa! Poi che dire della sfilata dedicata a Gauguin, ADORO!! Poi pensandoci non capita molto spesso che un designer si metta a disposizione del pubblico! Davvero molto bella e soprattutto interessantissima questa esperienza. Adoro le loro creazioni, soprattutto la collezione ispiratasi a Gauguin!! Lo stilista più bistrattato della blogosfera: in quanti blog abbiamo letto “aquiLONE” o “RAImondi” o anche entrambi?? Finalmente qualcuno si approccia a questa bella realtà in maniera seria.. Non è il primo tuo racconto delle esperienze di incontro con gli stilisti che hai fatto con Vogue che leggo e devo dire che l’ho apprezzato molto e soprattutto amo i collage che realizzi: sono un’espressione artistica che, accompagnata alle parole, riesce a raccontare il tuo punto di vista al 100%.. Bravo davvero! Grazie Iris per i complimenti, cerco di abbinare sempre arte, moda, design e letteratura, per far capire che la moda non ha solo ed esclusivamente la dimensione frivola che tutti conosciamo. finalmente , dopo un “periodaccio” di cose bellissime ! Alla fine della lettura del tuo interessante reportage mi è sorta una domanda : , come conciliano creativamente il ruolo di stilisti e Direttori di una Maison ? il primo è passione e l’altro un lavoro ( banalizzando)? Grazie per i complimenti sinceri. Ti rispondo subito senza molti giri di parole. Dalla discussione è emerso che con il proprio brand manifestano interessi verso una ricerca stilistica raffinata (a volte elitaria e di nicchia) in cui i dettagli richiedono una cura da couturier, potremmo definirlo un lavoro di ricerca. Le consulenze e le direzioni artistiche per gli altri marchi invece richiedono delle dinamiche diverse e la loro attività diventa di sperimentazione, andando oltre i loro canoni stilistici, rispondendo alle esigenze dei marchi e del target della clientela. La passione è un denominatore comune, ma declinato secondo più sensibilità. Anna ha detto questo?! beh…ha ragione…sinceramente il talento c’è, sono capi sofisticati ma portabili. Quello che hanno detto : “Quando sei un direttore creativo devi miscelare, non puoi essere te stesso al 100% perché devi metabolizzare un qualcosa che non è tuo.” è dannatamente vero! se ti fermi a pensare, in qualsiasi cosa, se fai da “consulente” o in qualche modo contribuisci a qualcosa non tua non potrai esprimere completamente te stesso. Mettersi in gioco e fare tutto da soli non è facile, ci vuole coraggio! ps. ho adorato i capi della prima foto della ss2009 per Ferré! Ho letto con interesse la parte riguardante l’indipendenza della moda rispetto all’arte, dal punto di vista teorico è un passaggio fondamentale per capire il lavoro del duo. Per i tuoi collage posso usare l’aggettivo “iconici”? 😉 Beh, forse te l’ho già detto, salvo sempre le tue immagini nel pc, mi servono da consulenza di stile e da approfondimento. I collage sui mosaici di Dolce & Gabbana li ho studiati nel minimo dettaglio! Ho avuto la fortuna di fare da vestierista alla loro sfilata nel settembre 2011, ho toccato con mano la loro collezione, avevo i brividi per l’emozione!! Post davvero interessante, complimenti! Mi piacciono molto queste iniziative “di contorno” alla fashion week. Ascoltare i creativi e conoscere le loro vite apre la mente a mio parere. Le poche volte che ho potuto ascoltare un designer, ne sono uscita con la mente che galoppava!